Use these Cat5e RJ45 network cables to connect your PC or other ethernet-enabled device to a hub, switch, or wall jack. These attractive cables are available in a variety of lengths. 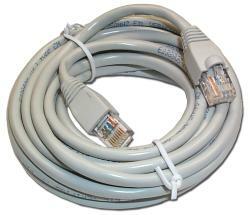 All cables include boots on each end, providing strain relief and protection of the RJ45 clip. In addition to standard network cables, we offer "crossover cables" which can be used to connect one PC to another without using an ethernet hub.